Receding front hairline can affect both white and black men. Can it be treated successfully? Today, there are numerous of different hair-care products and treatments to choose from. Unfortunately, many men are not satisfied with the prognosis of this pattern hair loss. However finding out about your receding hairline and appropriate treatments you need to take can help you to be better able to cope and feel more in control. The following are some frequently asked questions (FAQs) about this male hair loss. What is the exact cause of the problem? As well we know that each hair follicle on the scalp of the head has natural life cycle which is essential to replace old hair by new one. This consists of 3 main phases; growing phase (anegen), transition phase (catagen), and eventually resting phase (telogen). Anagen is the longest phase which can take years and vary from person to person. It is when hair is growing, about 0.5 – 1 inch each month. After years of growing phase, hair goes into catagen phase, getting slower to grow and hair follicle start to shrink. This can last over a few weeks. And eventually, hair will go into telogen phase, when it stops growing. In the end of this resting phase, the old hair falls out, replaced by a new hair – and then another anagen phase begins. At any given time, most of hairs on the scalp are naturally going with anagen phase. Only a few amounts of them go with catagen and telogen phases, causing a small amount of shedding hair about 50-100 hairs per day and this is normal. Receding hairline is usually an early sign of male pattern baldness or ‘androgenetic alopecia’ (the most common form of hair loss in men). Androgenetic alopecia for women is called female pattern baldness, which is also the most common hair loss type in women. Alopecia is hair loss – androgenetic is androgen & genetic. So generally, androgenetic alopecia means hair loss that is associated with androgen (male hormone) and genetic. In men with androgenetic alopecia, their hair follicles are genetically more sensitive to the activity of their androgen, especially one called dihydrotestosterone (DHT). In male pattern baldness, without known reason DHT can shorten the growing phase of hair. A normal growing hair that typically lasts about 3-6 years or more will be shorter by up to a few months. The bad news, this is followed with the progressively decline of new hair follicles growth, causing thinning hair. However, the exact cause of male pattern baldness is not fully known. In some cases, the problem may have nothing to do with DHT. Can women develop receding hairline, too? Interestingly, women with female pattern baldness are likely to not experience receding hairline. They are likely to have thinning hair all over the scalp, especially on top of their head. So receding hairline is male hair loss problem, and it is very rare in women (including for those with female pattern baldness). Another key point, while male pattern baldness is usually associated with the oversensitive of hair follicles to DHT, the same thing doesn’t go for women. It’s now clear that female pattern baldness has nothing to do with DHT. Some experts think that the decline of estrogen and aging may have more contribution. Who is at high risk to have receding hairline? It’s thought that receding hairline of male pattern baldness is hereditary hair loss. This means that it’s likely to run in families with history of the same problem, though NOT always. So if you have a family history of androgenetic alopecia (especially for first degree relatives such as parent, brother, or sister), you are at higher risk than others to have the same hair loss problem latter in your life. Age may have a role, too. 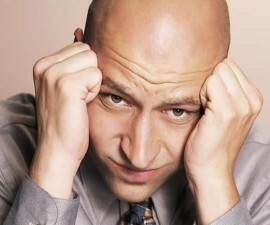 In fact, mild and severe cases of male pattern baldness are found in almost 50 percent of all men by 50 years of age. In other words, the risk is likely to increase as you age! How about diet, poor hair care practices, or other factors? Currently, there is no adequate evidence that the problem is associated with certain lifestyle or environmental factors. Can it occur at young age? It can occur at any age, including at young age. Even in a few cases, it is also found in babies. But receding hairline in baby is usually temporary. However in general, receding hairline of androgenetic alopecia usually starts at the ages of late 20s or early 30s. And the sign of partial baldness or complete baldness can be clearly noticed at 50 years of age. Again, it is likely to develop gradually as the age. How fast it progresses can vary since the amount of DHT and the level of hair follicle’s sensitivity to DHT can vary from man to man. At first, thinning hair occurs on temples (typically both sides). Over time the affected hairline recedes gradually, causing ‘M’ shape. Thinning of hair on the temple may be followed with thinning hair on the crown. Eventually, the two areas may meet and cause ‘U’ shape, like horseshoe shape. To figure out this process clearly, see this image! Does receding hairline always mean baldness? You may worry whether it gets worse and even causes baldness as you get older. Unfortunately, the chance of receding hairline associated with androgenetic alopecia to cause baldness in men is quite high. But in women with female pattern baldness, they are less likely to experience baldness. Although their crown can be quite shinny, but in fact baldness is rare in women. Depending on the treatment you are taking, the bald spot can be prevented. And this can vary, too. But in general, the risk of baldness from androgenetic alopecia can be divided into two categories; partial and complete baldness. Hairs are composed by sensitive cells. They can be sensitive enough to respond to problems in other parts of body. Even they are also quite sensitive to changes in weather and environment (see also seasonal hair loss). In fact, hair loss can be a sign of different health conditions. These may include lupus, thyroid disorders, psoriasis, eczema, some autoimmune disorders, and much more. Thankfully, receding hairline is usually not harmful. It also doesn’t increase your risk of having particular medical conditions. Does this mean that you can leave it untreated? 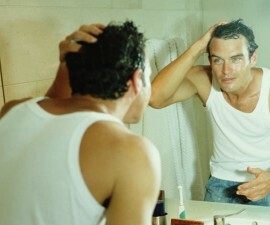 The main reason of why men looking for treatment when their hairline recedes is due to cosmetic reasons. It is harmless, but it can be very embarrassing and distressing that may lead to low self-esteem. However, there are also some men who can successfully deal with it. In fact, baldness is not always bad. Furthermore, many hairstyles are available to help boost your confident even though you have receding hairline. So in general, the treatment is not always necessary (optional). For more information about what will happen if it is left untreated, see this section! But if you do find that it bothers you a lot, some treatments are available. What is the most effective treatment to cure it? Propecia is the most common treatment recommended. It can help target the underlying cause of receding hairline in most cases, DHT. It also has been officially approved by FDA for the first treatment of male pattern baldness (including for receding hairline). Minoxidil is also quite common to be used for male pattern baldness treatment. But when it comes to treating receding hairline, minoxidil is NOT too recommended. It also doesn’t have any effect on DHT. It is likely to be used for female pattern baldness. But both propecia and minoxidil cannot provide permanent result. Hair loss is likely to come back if these treatments are discontinued. Some experts say that androgenetic alopecia is incurable, or you cannot cure it permanently. But hair transplant may help you a lot. The chance to achieve permanent result from hair transplantation is pretty good. The good news, most men with male pattern baldness are good candidate or able to take hair transplant. Because, most of them usually have a stable donor site for hair transplantation! But it’s important to take this treatment NOT too young so thus there is small chance of choosing the wrong donor site. On the other hand, women with female pattern baldness are likely to have thinning of hair on their entire scalp. As a result, there is usually no adequate stable donor site and therefore most of them are not able to take hair transplant. When and How Does Receding Hairline Start? Why Does Baby Have A Receding Hairline? Does Receding Hairline Always Lead Baldness?